James M. Griffin, Esquire has been practicing real estate law in the Washington Metropolitan area for over 30 years. Jim heads the Builder Division of Counselors Title, LLC and is of counsel to Pardo & Drazin, LLC(formerly Darby, Nalls, Smyth & Muldoon, LLC). He has worked many years with a number of the Washington area’s premier builders. Jim’s areas of specialty include not only builder representation, but also residential and commercial closings, lender representation, and 1031 Exchanges. 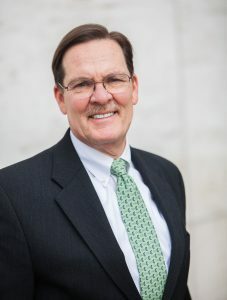 He received his law degree from The Catholic University in 1975 and is a member of the Montgomery County, Maryland, District of Columbia, and American Bar Associations. Following completion of law school, Jim served as the law clerk to the Honorable Joseph M. Mathias, Judge of the Sixth Judicial Circuit of Maryland from 1975 to 1976. Jim is a former Adjunct Professor at Montgomery College, has lectured extensively on legal/real property issues, and has authored a number of articles in builder and real estate publications. He and his wife have five children. He is active in youth sports programs, the Catholic Youth Organization, school fundraising, and is a former member of the Board of Trustees of St. John’s Episcopal School.